Satellite and birds eye views are set to be supplemented by a street level view of the world, as demonstrated by Microsoft's Virtual Earth Team. 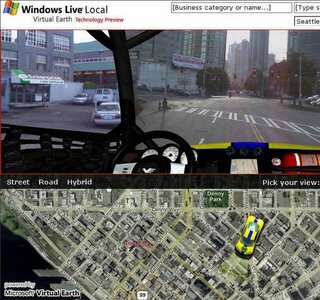 The team kitted out a fleet of vehicles to take 10 million photos of Seattle and have put together a great system where users drive or walk around the virtual city with an an AJAX web interface. Take a look at what they have achieved without resorting to flash. It definitely has a technology preview lumpiness about it, but certainly a street level glimpse of the future.